[BINGHAM, Minerva Clarissa (née Brewster)]. [Ponape Island (Micronesia), Mission Press, 1858]. 4to (24 x 20 cm). Set in roman type with rules dividing the page into 5 compartments. 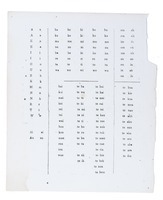 A rudimentary one-page primer for the language of the Gilbert Islands in the South Pacific, printed in "a few copies" for the missionary Hiram Bingham junior (stationed on Apaiang Island), whose wife had prepared it, and produced by the printing office of the American Board of Commissioners for Foreign Missions (ABCFM) at their mission on Ponape Island. It was intended as an aid to teach the natives the alphabet and take the first steps toward teaching them to read. The language, very close to that of the Caroline Islands where it was printed, is a member of the Austronesian family of languages, which includes Maori. The Gilbert Islands were often called "Kingsmill" in the 19th-century, hence the title "Kingsmill primer" in the manuscript note on the copy in the ABCFM collection at Harvard College Library, which continues: "printed at Ponape, Sept. 1858". With the upper right corner torn off, not approaching the printed letters or rules, a couple small marginal tears, 1 small hole in a blank area and a few small spots, but still in very good condition. 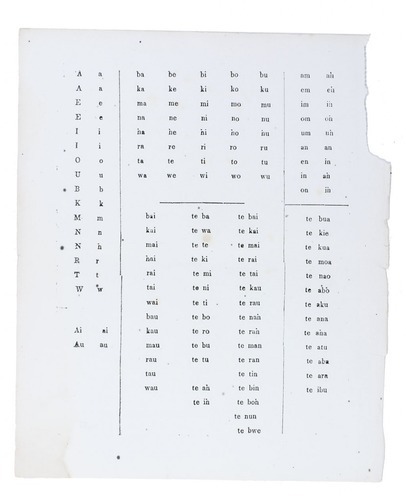 An ephemeral teaching aid and one of the earliest examples of printing in Micronesia: an extraordinary survival. J.E. Alden, "A press in paradise: the beginnings of printing in Micronesia", in: Papers of the Bibliographical Society of America, 38 (1944), pp. 269-283, item 14.